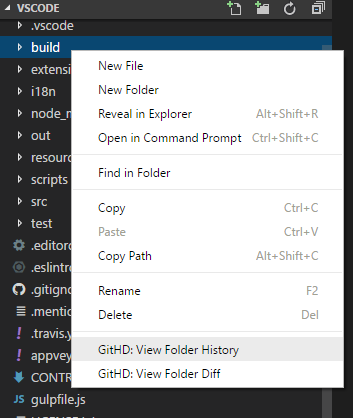 Visual Studio Code>Other>Git History DiffNew to Visual Studio Code? Get it now. View git history. View diff of committed files. View git blame info. View stash details. View git history. View commit details. View diff of committed files. View git blame info. View stash details. GitHD aims to bring the most useful git history inside with the simplest and the most convenient way. Git blame view. You are able to see the latest commit info which presents at the end of each line. Git stash view. You are able to see the change details of stashes. 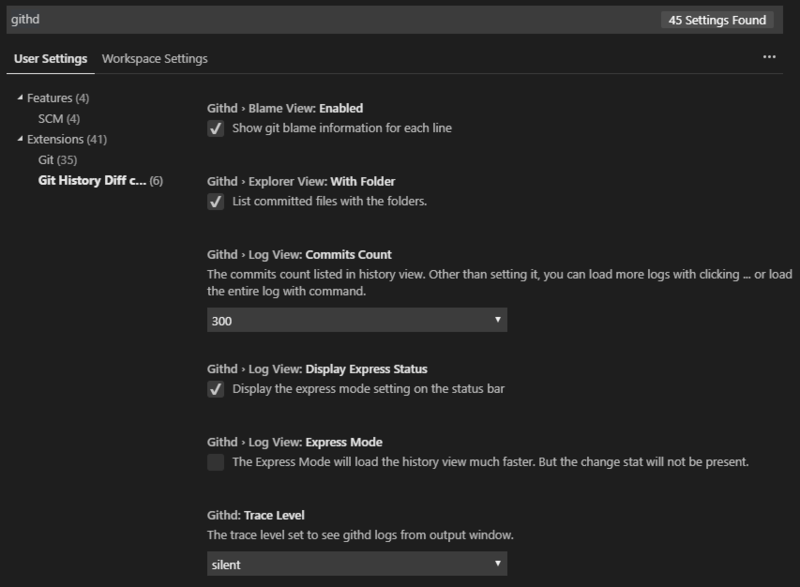 Allow user to input two commits to see their branches or specified files diffs. 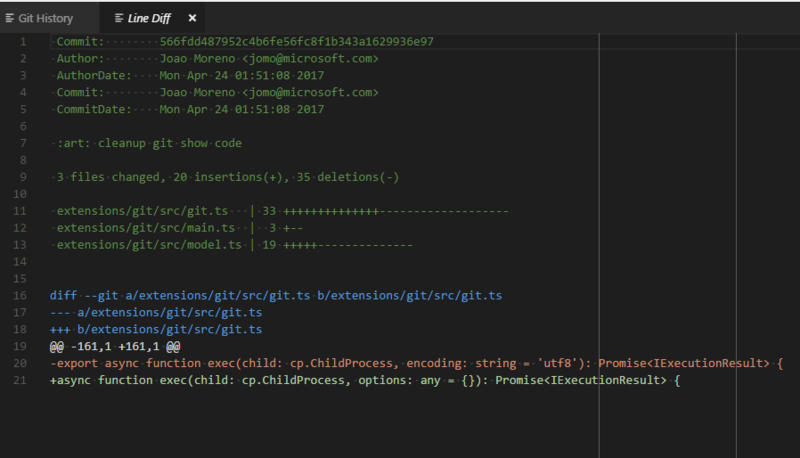 Allow user to see file diff between un-committed local and specified commit. Move the color configures to Contribution point so that you are able to configure them with customized color. Some UI related improvments and fixes. Tracing system introduced (tracing is disabled by default). 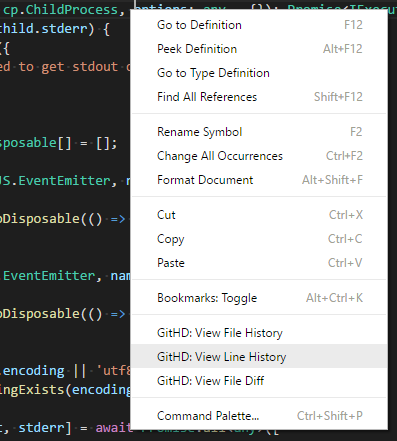 Select a commit from the history view to see diff of committed files. View git stashes and related files' diffs. View git blame which displays the latest commit info at the end of each line. Hover on it to see details. Input a commit sha1 to see diff of the committed files. View all the diffs between current branch and the selected one or between the two selected ones. View the diff of a file or folder between current branch and the selected one or between the two selected ones. View file diff between un-committed local and specified commit. Press F1 and type or select below commands to run. Note, when you select different branch to see it's history, the repo will not checkout to that branch. Select two branches or refs to compare with current branch. You are able to select a local branch to compare with another local or remote branch. You are able to see the latest commit info of each line. Hover on it to see the details and click the SHA to see committed files and their changes. You could disable it in the settings. When the express mode is enabled, the History View will be loaded significantly faster especially when there are too many commits. But the stat info for each commit will not be displayed. You could toggle it in the settings. Press F1 and type or select Preferences: Open Workspace Settings or Preferences: Open User Settings. Search githd and set the configurations. Big thanks to the contributions of Thomas Müller, Eugene Voynov and yigger! This is the tool I wanted but could not find so wrote myself. Many things happened in my life during this year but little to the GitHD although I played with it almost everyday. Finally I could spend some time to make it better. I really need to thank my family, my wife, my little kid, my parents. Quote a lyric, you raise me up to more than I can be. THANK YOU!